Late last week I hit a local antique store in search of one specific item that I need was sure they'd have. A few hours later, after not finding that one item (a plastic 200 ft. 8mm film reel, in case you're wondering) & instead diving head first into a collection of postcards, film, negatives, and prints, I emerged with a ton of wonderful pieces to add to my collection. This is the first in what is going to be a series of many posts sharing the treasures I picked up that day. Please enjoy these linen photographs of Washington, D.C. All are unused, the captions are what each card has printed on the back. And if you're so inclined, have a listen to the Magnetic Fields -- Washington, D.C. while you're at it. 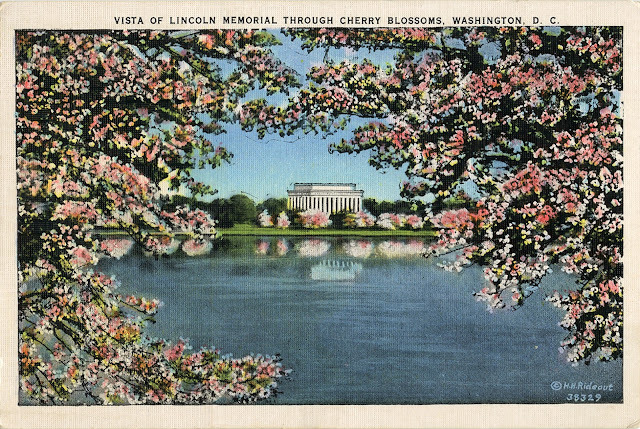 "These beautiful Japanese Cherry Blossom Trees which line Riverside Drive, Potomac Park, are a gift of the Japanese Government to the United States Government. In the Spring of the year they are a most beautiful sight and might suggest to the traveler a scene in old Nippon itself." 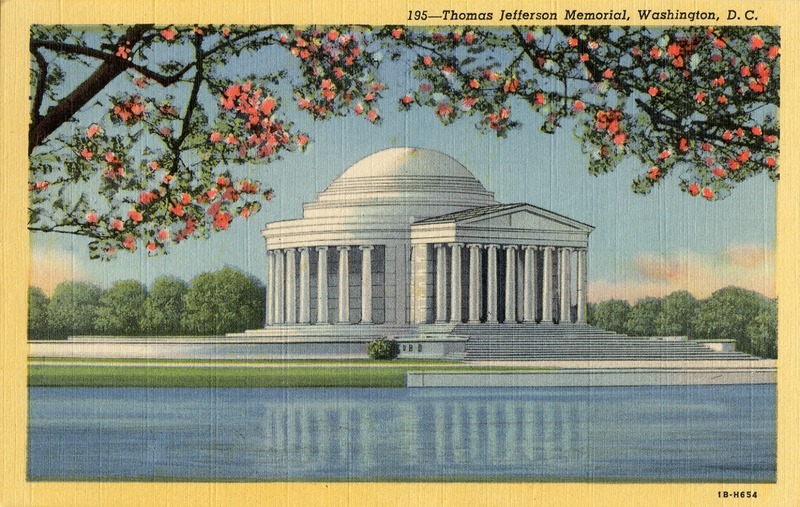 "The Jefferson Memorial is at the south end of the Tidal Basin. Thomas Jefferson of Virginia (1743-1826) was the author of the Declaration of Independence and one of the Signers. As a member of Congress he originated our system of coinage. Was Secretary of State in Washington's first term, Vice-President with John Adams and President 1801-09. Founder of the first Republican Party, from which the Democratic Party of today claims descent." 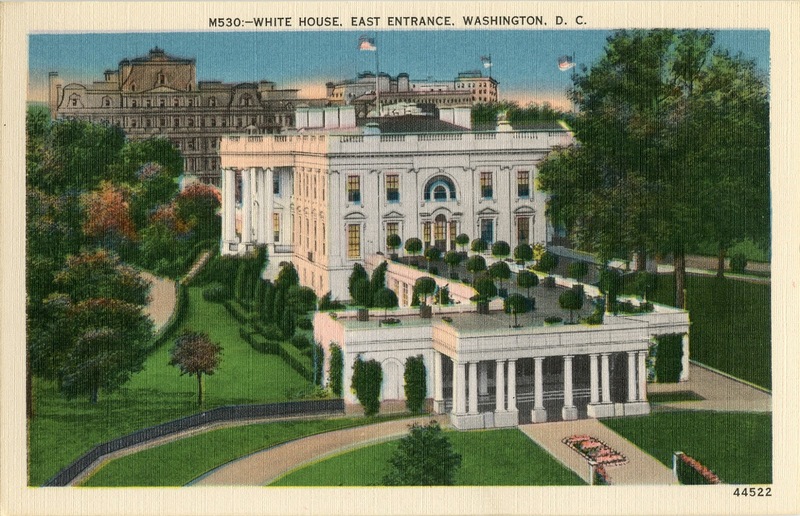 "The Executive Mansion stands sedately at 1600 Pennsylvania Avenue, about a mile and a half northwest of the Capitol Building. 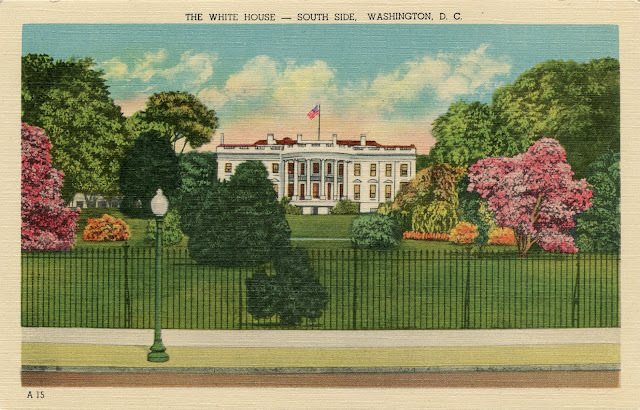 The White House, built of white-painted gray Virginia sandstone, is 170 feet in length and 85 feet wide. Two stories high with a basement at ground level and an attic. Cornerstone laid in 1792. President John Adams in 1800 was the first occupant." 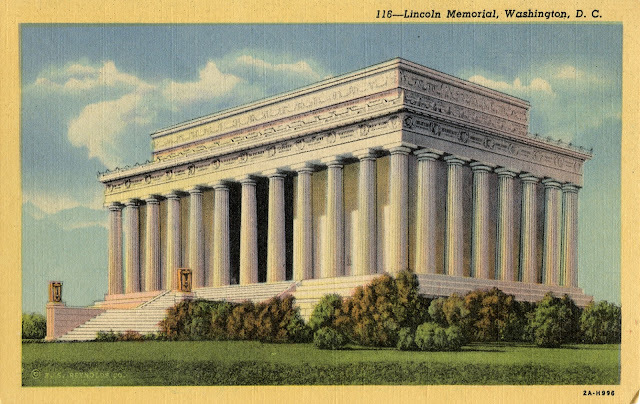 "The Lincoln Memorial, modeled after a classic Greek Temple, is situated on an eminence in Potomac Park on the banks of the Potomac River. It is a monumental marble structure and a worthy and fitting memorial to Abraham Lincoln. Statue of Lincoln (by Daniel French) is in the center of the memorial, while smaller halls at each side of central space contain Second Inaugural and Gettysburg addresses. Surrounding the walls incasing these memorials is a colonnade of 36 columns for each of the 36 States in the Inion at the time of Lincoln's death. Immediately in front of the Memorial is a large reflecting pool, the placid waters of which mirror the classic lines of this beautiful Temple and the Washington Monument." 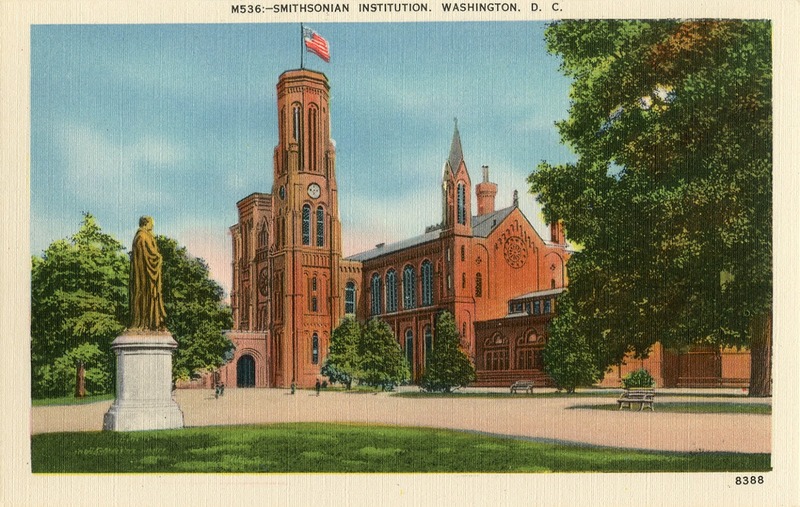 "This is one of the most beautiful structures of its kind in the world, the gift of the late Andrew W. Mellon to the nation. 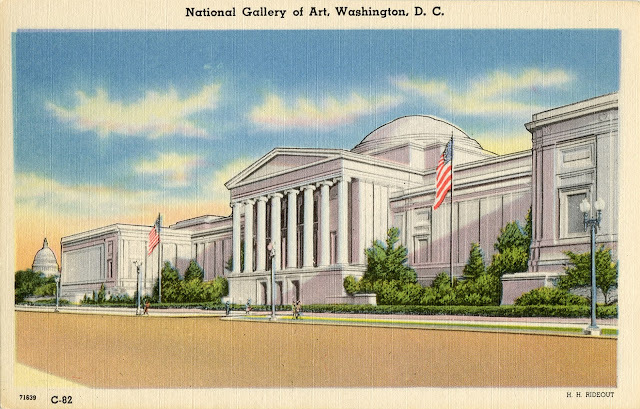 The Gallery houses the great art collections of Mr. Mellon and Samuel H. Kress of New York." "The White House has been the home of the Presidents from the time of John Adams to the present. Washington selected the site, laid the corner-stone in 1792, and with his wife inspected the finished building in 1799. The building is of Virginian freestone. After the house had been fired by British troops in 1814, and only the walls were left standing, the restored exterior was painted white to obliterate marks of the fire." 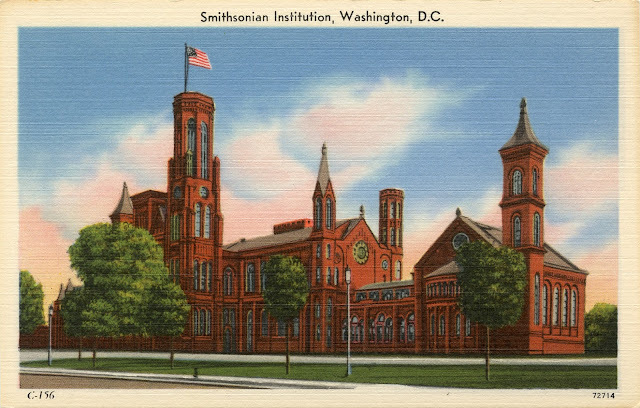 "The Smithsonian Institution was founded in 1846 by the generosity of James Smithson, "for the increase and diffusion of knowledge among men." Its purpose is to stimulate, encourage and reward scientific investigation and study." "The Smithsonian Institution is located on the Mall near 10th Street. It was created by Act of Congress in 1846, under the terms of the will of James Smithson to found an establishment for the "increase and diffusion of knowledge among men," under the name of the Smithsonian Institution." "A stupendous shaft of granite, 555 feet 5 1/8 inches in height. It is 55 feet square at the base, 34 at the top, and terminates in a pyramid of pure aluminum. The foundation of rock and cement is 36 feet deep, 126 feet square. The corner stone was laid in 1848, the monument was finished in 1885. It is the highest work of masonry in the world." 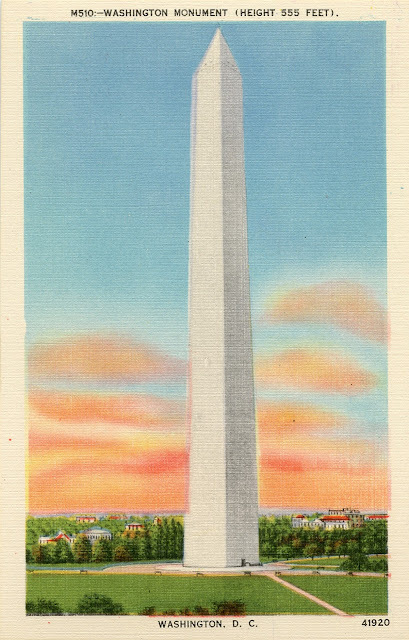 "The Washington Monument is one of the tallest structures in the world built of stone and masonry. It is a white marble shaft with a non-tarnishing aluminum tip which looks like silver. 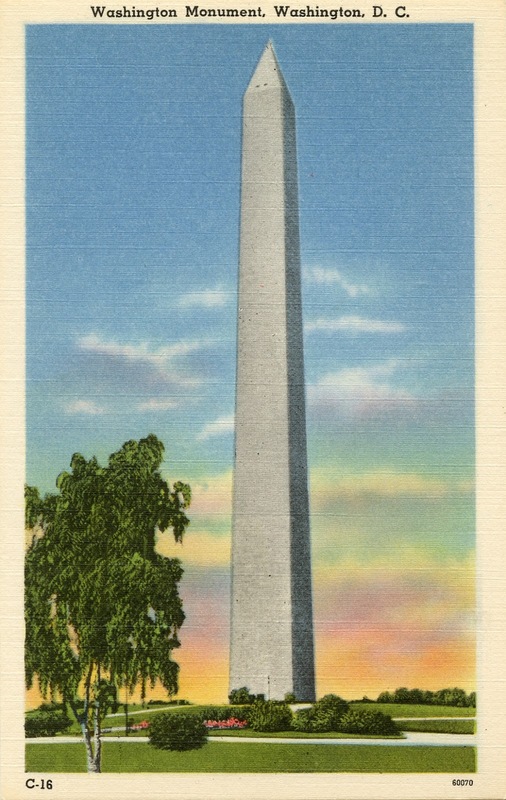 The Monument stands 555 5 1/8 inches high." Coming soon -- Balboa Park Turns 100, Part 4.